French toast is my dad’s breakfast specialty. I used to love waking up on the weekends to his special French toast breakfast! Although my favorite French toast is made with brioche, whole wheat bread is healthier. With the Magic Bullet, you can make a healthy French toast breakfast in almost no time! Blending the batter makes it nice and airy. You can top the French toast with fruit, powdered sugar, maple syrup, or even Nutella! My favorite topping is bananas, strawberries and whipped cream – yum! 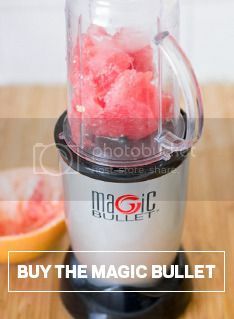 Add all ingredients, except for the bread, to a Magic Bullet pitcher and blend until foamy. Pour the batter into a shallow bowl. Heat a skillet over medium heat and grease with butter. Dip a slice of bread in the batter and flip over. The bread should be soaked with batter. Fry in the skillet on each side for about 2-3 minutes. Careful not to burn!